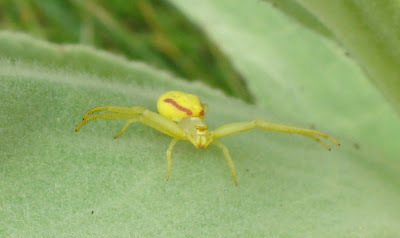 This goldenrod crab spider is waiting for some prey to turn up. It doesn't spin a web, just lunges out and grabs its victims. I'm sure that this striking furry-leaved plant should be easy to identify, but I haven't managed to yet. 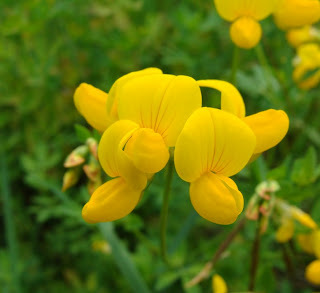 It goes particularly well with the American vetch that is also flowering at the moment. 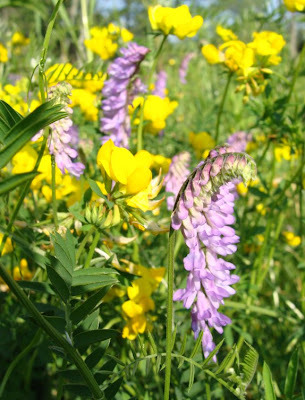 It's a fore-taste of the colour combination of the goldenrods and asters that will appear in late summer. It kinda looks like mullein. If it sends up a huge flower stalk then you know it is. Daphne, thank you so much - I looked up mullein and I'm sure you're right. 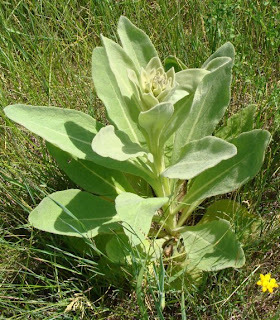 The pictures of Common Mullein on Wikipedia look just like it. Not knowing what it was has been annoying me for ages!